The main character Don Quixote is a poor Spanish nobleman, who wants to relive the glory of the knights of olden times. His family thinks he is crazy and takes away the books that contain the stories of knights. They also try to keep him confined, but he escapes with his neighbor, Sancho Panza. 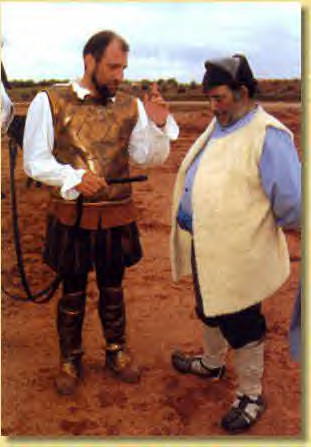 Sancho Panza becomes his servant and although he does not have the education of Don Quixote, he is wiser and as such is able to keep Don Quixote out of trouble. 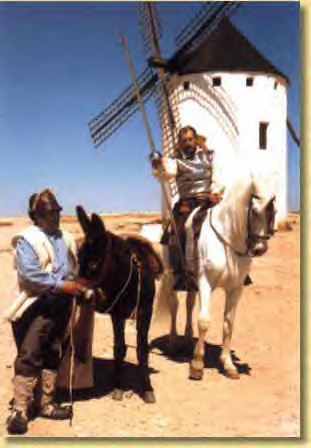 One of their most famous adventure occurs when Don Quixote mistakes a bunch of windmills for giants. "Fortune," said Don Quixote to Sancho Panza, "is arranging matters for us better than we could have hoped. Look there, friend Sancho Panza, where thirty or more monstrous giants rise up, all of whom I mean to engage in battle and slay, and with whose spoils we shall begin to make our fortunes. " "Those you see there," answered his master, "with the long arms, and some have them nearly several miles long." "It is easy to see," replied Don Quixote, "that you are not used to this business of adventures. Those are giants, and if you are afraid, away with you, while I engage them in fierce and unequal combat." "Fly not, cowards and vile beings," he shouted, "for a single knight attacks you." With lance braced and covered by his shield, he charged and attacked the first mill that stood in front of him. 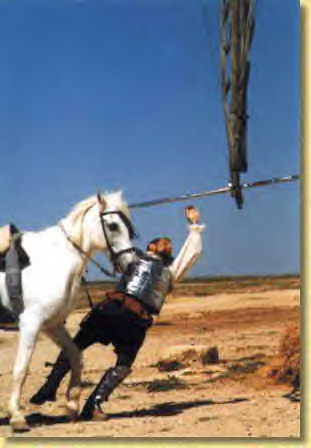 But as he drove his lance into the sail, the wind whirled it around with such force that it broke the lance to pieces. The wind from the sail swept away with it horse and rider, and they were sent rolling over the plain, in sad condition indeed.